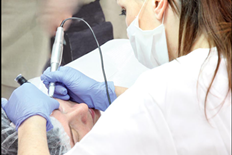 The Nouveau Contour Academy offers a range of training programmes. The All-round Course is a seven-day training consisting of four consecutive course days in which you will learn how to apply eyebrows, eyeliner and lip liner in theory and practice. 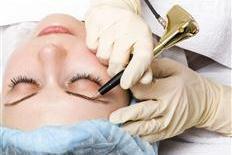 After these four days of training, you will be ready to work with permanent make-up. Subsequently, there are three separate follow-up days that you can schedule as you deem fit. The All-round Course is taught in small groups, with one teacher per three participants to ensure optimum attention and support. If you want to specialise further and learn advanced techniques, the Master Trainings are made up of a one -day training session that will teach you advanced techniques, such as the hair stroke technique for eyebrows, additional techniques for eyeliner including the smudged, duotone and designer eyeliner, techniques for shaded and full lips or medical pigmentation, pigment removal, hybrid pigmentation and camouflaging scars. There are also many other Master Trainings needles and techniques and colour theory, that allow you to continue to specialise.